This week’s must-read comes from The A/V Club, who interviewed props master Chris Call. This very in-depth conversation takes a look at his career, propping everything from Brooklyn Nine-Nine and Alias, to The Closer. The article takes the time to really dig into the nuts and bolts of a TV prop master’s job and Call’s career path, going far beyond the standard “what’s the craziest prop you’ve ever had to make?! ?” kind of questions. Wired takes a look at Adam Savage’s replica prop-making hobby, and asks the burning question of why he does it. Spolier alert: it’s because props can tell a story. What did Kermit the Frog look like before the Muppets? Collector’s Weekly takes a look at the history of the Muppets, including photographs of a pre-Sesame Street Kermit, and delves into Jim Henson’s journey from five-minute sketches on a local TV station to a worldwide empire of puppet and creature manufacturing. Fast Company has an article on five dream jobs that will make your inner child extremely jealous, and “prop master” is one of them. 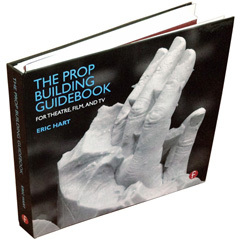 Yes, being a prop master is on-par with running a cat-café or being a chocolate scientist. I’ll have to remember I’m living the dream the next time I’m cleaning a mouse nest out of the bottom of a stove or lugging a sofa up three flights of stairs.